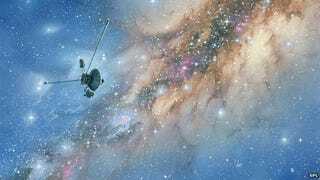 Scientists had announced earlier that Voyager 1 had left the solar system, however the Voyager team has issued its own statement. The scientists still don't know for sure, however, whether the probe has entered interstellar space or a mysterious in-between region beyond the solar system. Voyager 1 is within a new region called 'the magnetic highway' where energetic particles changed dramatically. A change in the direction of the magnetic field is the last critical indicator of reaching interstellar space and that change of direction has not yet been observed."